Wow...If You Love Peppermint...Here's a Tea For You! Summary : Where to begin? How about wow! How about superb! That about sums it up when describing this top-notch peppermint tea from Culinary Teas. The aroma of this tea is strong, nearly overpowering. And the taste, well, shall we say peppermint? Review : A week earlier I sampled the Organic Peppermint Tea from Culinary Teas. And I was extremely impressed, calling it my favorite peppermint tea up to that point in time. As such, I was curious to see what the non-organic version of their peppermint tea would taste like. Because I suspected that the leaves for both these teas basically were the same, with the only difference with one being organic (and a bit more expensive) and the other one not being organic, I'll confess, I had REAL high hopes for this peppermint tea. And my hopes, thankfully, were not dashed on the rocks of despair. This tea was absolutely fantastic, being in every single way comparable to the Organic Version. 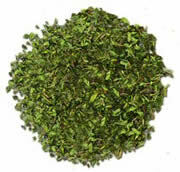 Like the organic version, this peppermint tea from Culinary Teas contains exactly one ingredient : peppermint leaves. And these are GOOD leaves too. They have a nearly overwhelming aroma to them. The aroma is so strong, in fact, that the fragrance can be smelled before the vacumn sealed bag is fully opened! And so armed with the happy fragrance of peppermint everywhere in my kitchen, I went ahead and brewed a cup. I let the tea brew for the full 7 minutes as I much prefer a strong peppermint tea over a weak one. After all...if I want a weak one, I can always buy a cheap grocery store peppermint tea. So, the next obvious question is, what did this tea taste like. Do I dare say...ok...I will. It tasted like peppermint, of course! Really, really good peppermint. No bitterness. No harshness. And a nearly overpowering taste of peppermint. Truthfully, a peppermint life-saver holds nothing over this tea...the taste of peppermint in this tea is that strong. The next obvious question, then, is how did this tea stack up against the Organic Peppermint Tea version that Culinary Teas has? That question is a bit harder to answer. But truthfully, I detected basically no discernible difference in either taste or fragrance. As such, if you are deciding in-between which of these two peppermint teas to get, base it on your budget (organic is somewhat more expensive) and health reasons (organic is always good for your health). Recommendation : Absolutely. This is one of the best, if not the best, peppermint tea I've tried. In fact, the only peppermint tea that stacks up to this one is the organic peppermint tea version that Culinary Teas has. To sum it up...if you love peppermint...GET THIS TEA. Brewing Instructions : Pour 6-7 ounces of boiling water over tea pieces leaves. Let steep for 5-7 minutes. You'll want to use 1.5 to 2 teaspoons of leaves for each cup of tea. I let the tea brew for 7 minutes for a stronger taste. Bigelow Lemon Herb Tea : If you enjoy the taste of lemon, you'll like this moderately strong tasting lemon tea.